I recently posted about my daughter's aspiration to be an actress and how I try to encourage that desire, while maintaining a firm grip on being a realist. Yesterday, I had an opportunity to put that into action. In our family, we call such opportunities "checking the box". When something is high on the "I wanna" list of either of my kids, I do what I can to check that box. Some might call it "filling the bucket", but I happen to like lists, so "checking the box" it is. 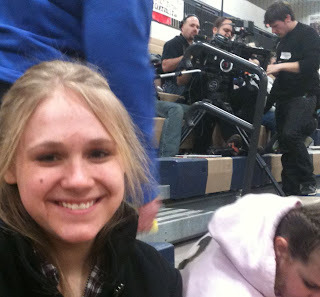 Anyhow, a friend informed me that a crew was filming a Hollywood film, A Family Weekend, at a local sports tournament (being attended by her daughter's team). Friends and family were invited to stay after the tournament and be part of a crowd scene. It wasn't far and we were available, making it a perfect opportunity for my daughter to see first-hand what might be involved on a film set. Granted, she really wants to be on Broadway, rather than in front of a camera, but she has interest in both. I really didn't know what I was getting into. I falsely thought it would simply be a quick crowd swipe of us all cheering and we'd go home. The actual filming of the crowd took about 2 hours and we were required to act! That would have been ok if it were just my daughter, but I was seated there too. I'm...um...acting-challenged. Ok, so it didn't required a ton of acting skills (cheer, look surprised, shocked, or concerned, etc. ), but it was more than I expected. With all the filming going on, I was soon wishing I had made that hair appointment that is about 2 months past due. I have to admit, the whole process was interesting to watch. It wasn't an exceptionally huge crowd either, so there is a good chance that we'll end up in the final footage. My daughter wisely planted herself in the front row. Those looking for fame need to be opportunists, after all. This pic was toward the end, when they were filming the crowd from behind. There were shots from all angles and I hope our time involved gets my daughter at least a few seconds of fame! If not, at least it was a learning experience on how things are done on a movie set. An added plus - we discovered that one of my daughter's favorite actresses, Kristen Chenoweth (Wicked, West Wing), stars in the movie! Founded by entrepreneurial parents searching for a better way to help students achieve their potential in math,TenMarks is an online subscription service covering math content for grades 3-10. When signing up for the program, both the parent and the student receive separate login information. Each week, the student is assigned a certain number of worksheets to complete. The default is 4 weekly worksheets, but a parent can adjust the assigned number in the range of 3-7 The worksheets are done completely online (e.g. they are not printed out) with multiple choice answers. From their account parents can view report cards, customize curriculum, and set up rewards for each student. While this might all sound a bit ho-hum, TenMarks has a list of features that makes this program more appealing than it initially sounds. The information is organized, both visually and for teaching concepts. Each grade has a list of albums to complete. One album, consisting of tracks, covers an entire concept. Each track covers one single concept, with worksheets assigned for each track. Furthermore, parents have the option of removing or rearranging albums. While the material sequence is very organized, it is also visually organized for the user. When a student signs on, the progress they've made is very clear. The page shows the album they've just completed, the current worksheets, and what is ahead. Also, there is a visual display with outline figures that are colored by the percent of work completed. Students have the option to practice concepts and are also assigned tests. In the practice section, students can select worksheets from any album from any grade. Whether they need some review, or would like a challenge, the practice section is the place to go. Also, timed tests are available for every album. If a student does not score well, the tests can be taken again. One of the best features of this program is the hints and videos available for each question. I know that often times my children will call me over for help with their regular math work and all they really need is a little hint. TenMarks has 3 hints available for each question and 1 video. The program keeps track of hints and videos used. Overuse will reduce the level of concept strength, which is also tracked for each concept. Worksheets that have low concept strength are reassigned to the student. It isn't just all work and no play either. Students can earn unlock games as they complete worksheets. Parents can also set personalized goals for motivation. Now, there are a few issues I did have with the program. One of the greatest irritations was that sometimes the videos did not match up to the question. For example, my son was working on a problem that required him to determine if a number was divisible by 4. Not knowing how to approach the problem, he clicked the video. While the video did talk about determining divisibility by other numbers, it did not show the student divisibility by 4. He was still stuck. Also, one of the videos used symbols for division that weren't the norm. It had potential to be very confusing for some. While I loved that the videos were available, they sometimes were not as helpful as they could be. Another issue is that there were no limits on the games once they were unlocked. Unlocking the games was very motivating, but the games themselves were very tempting. My kids were great about not playing the games until after they finished a certain number of worksheets, but the problem cane with losing track of time. Many of the games weren't related to any math concepts and were mindless (though apparently fun!). Lastly, while the multiple choice had appeal for my pencil-phobic son, I also had to keep an eye on how he was approaching his answers. Sometimes he would just make a guess, and he's very good at intuitively coming up with the correct answer without even really knowing how to work a problem. As with any online program, a parent still needs to keep tabs on the student to make sure they are using the program as fully intended. Overall, I really felt that TenMarks achieved the three simple principles upon which the program is based. The learning is personalized, help is available on demand, and the program offers (and forces through reassignment of concepts) plenty of practice. I felt the visual layout of progress was very encouraging to the student and I liked the control features given to the parent to customize the curriculum. The minor irritations experienced did not outweigh the variety of positive features offered. Strangely enough, though they have done numerous online math programs, both of my kids didn’t mind doing the worksheets on TenMarks. In fact, my daughter would often do TenMarks before her other work, rather than putting it off as she typically does with math work. The structure of TenMarks, in combination to the progress tracking and reward systems, seemed to appeal to my two indifferent math students. With math not making the top of the list as a favorite subject, it wasn't something that brought on lots of excitement. However, TenMarks was a program they willingly used without much complaint. In our house, that is quite significant. While I would not use TenMarks as a stand-alone program, it is definitely one to consider for supplement and practice. TenMarks is available at a very reasonable $10 a month, $49 for 6 months or $89 for 12 months. You can try the entire system by signing up for a free trial. Visit the TenMarks website to subscribe or learn more. Read what other reviewers had to say about TenMarks by visiting the official TOS Homeschool Crew blog. I don't know about you, but this is the time of year that I long for spring. I'm tired of being cold and wondering if the sun still exists. It doesn't help that there are still MONTHS left of this climate here in Michigan. What sometimes gives me a pick-me-up is to plan activities and purchases for the warmer months ahead, even if it seems they may never get here. Perhaps thinking about what seeds are needed for the garden, exploring summer camps for the kids, or checking out some new swingsets or patio furniture for the backyard is in order? Whatever your spring purchase needs, CSN Stores have over 200 online stores to shop and help bring you a little warmer weather cheer your way. And the good news is, you don't have to head out into the cold to shop! Stay tuned for another CSN Stores product review in the near future. I hope to find something to get me out of the winter blues. 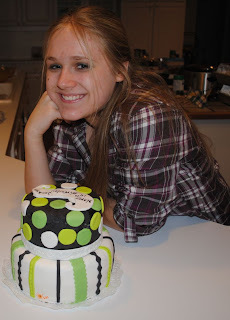 My daughter recently turned 14. When she was little, her birthday was equivalent to a national holiday. She's mellowed some her in "old" age, but birthdays are still big occasions around here. We didn't have a big birthday party, but Grandma still made a special cake that matched the colors of her bedroom, which was remodeled this past summer. When it comes to presents, it is always hard to come up with the perfect gift for this girlie. She's pretty content with what she already has, and with a birthday shortly after Christmas, any ideas have already been used. However, less than a week before her birthday I discovered Taylor Swift tickets would be on sale. My daughter is more into musicals than the latest pop, but Taylor Swift is one mainstream artist she really enjoys. Furthermore, she's never been to a concert, despite an attempt to go see Taylor Swift last year. I'm always for gifts that are an experience, rather than another thing to sit around the house. I had fun making a custom musical card announcing the gift from a blank that I purchased here for another project and had an extra left over. I think she agrees it was a great gift for a 14th birthday. Is there such a thing as a lapbooker wanna-be? I don’t lapbook, but I love the way they look and think they are an excellent way not only to help your child retain information, but also a pretty awesome record of what they learned. It sure beats the file cabinet full of papers and used workbooks I currently have. And while I’m not a lapbooker, I do know paper and folding. You see, we run a family bindery business and we are always thinking of ways to help homeschoolers. Between the one lapbook I’ve made for a review and all the spectacular lapbooks I’ve seen made by my lapbooking friends, I’ve been inspired to use what I do know – paper products – and combine it with my desire to bring products to homeschoolers. If you are a regular reader, you heard about my new venture in the fall. Please bear with me as I continue with a little self-promotion and after-holiday reminder. :) Enter Pear Educational Products, our new lapbooking supply company. Our products were designed with the help of talented homeschoolers, to be sure they meet the specific needs of lapbookers. 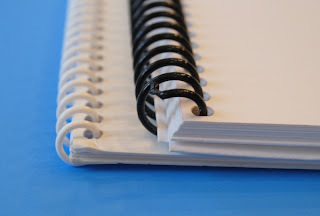 Our first line of products are our Spiral Bound Project Books. 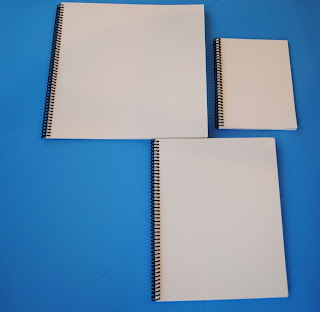 These acid-free blank books come with an extra large spiral to allow your book to expand in thickness as you add to the pages. 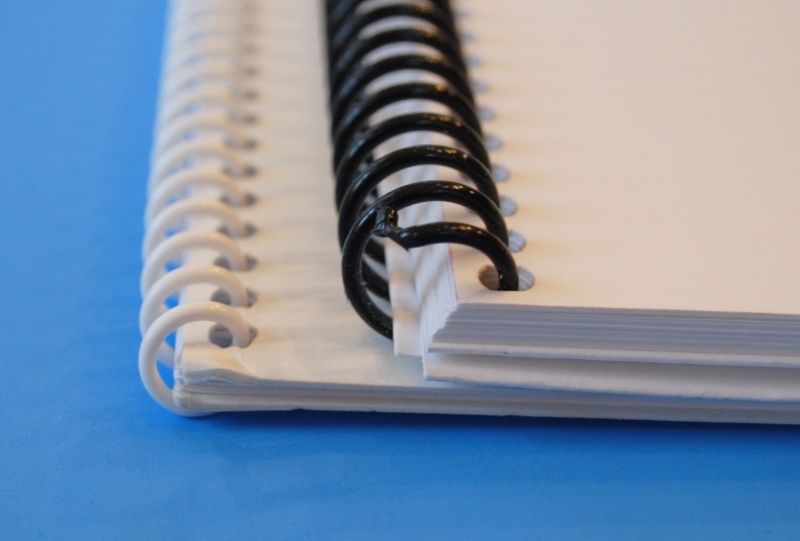 Our spirals are larger than standard, allowing your notebook to expand as you add to the pages. 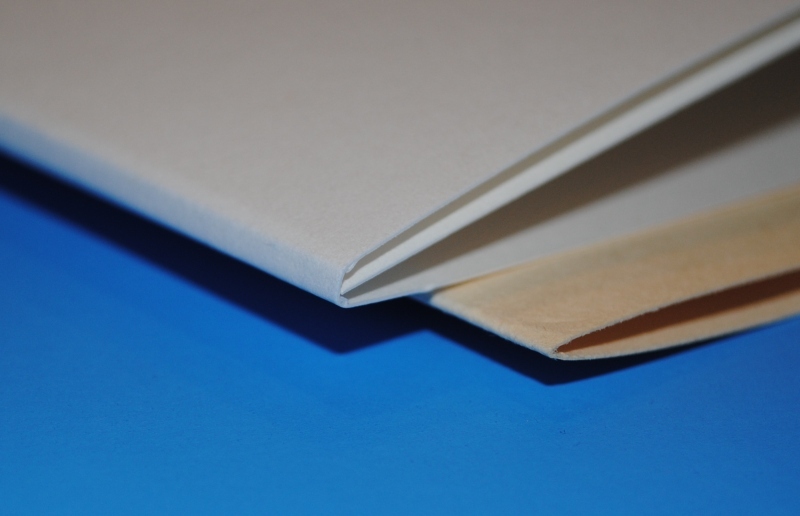 In addition, the last page of the larger books includes a double pocket to store supplies during construction and additional records when final. Handy double pocket to hold all your supplies. 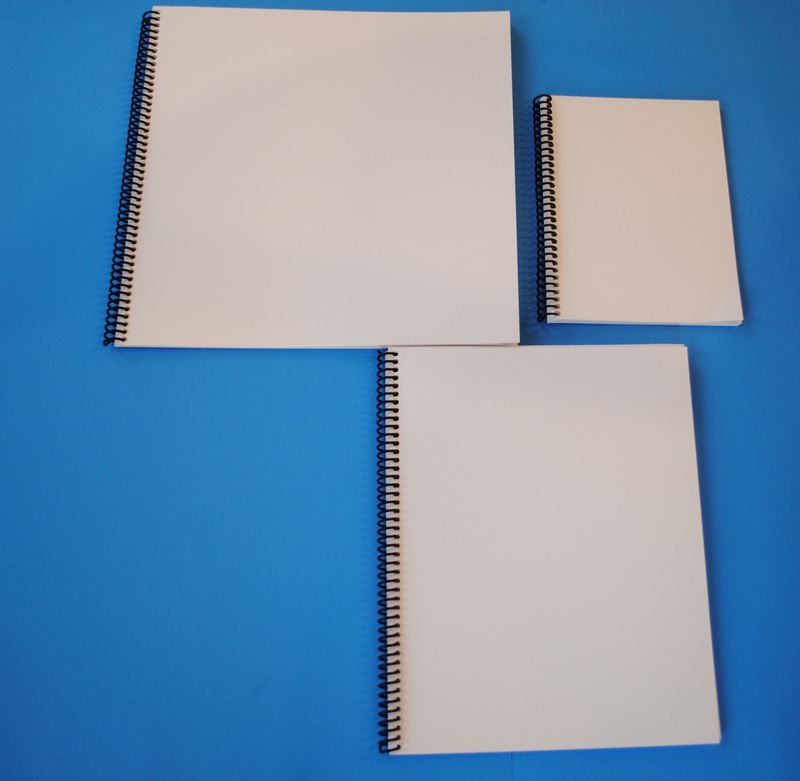 There are three sizes available, 12" x 12", 9" x 11 1/2", and 6" x 8", for a variety of your project needs. Our next line are our Fold-Up Project Bases. The one lapbook I ever made involved manipulating a manila folder, including taping cardstock to it. The end result was a bit sloppy, which was disappointing given the work put into the project. 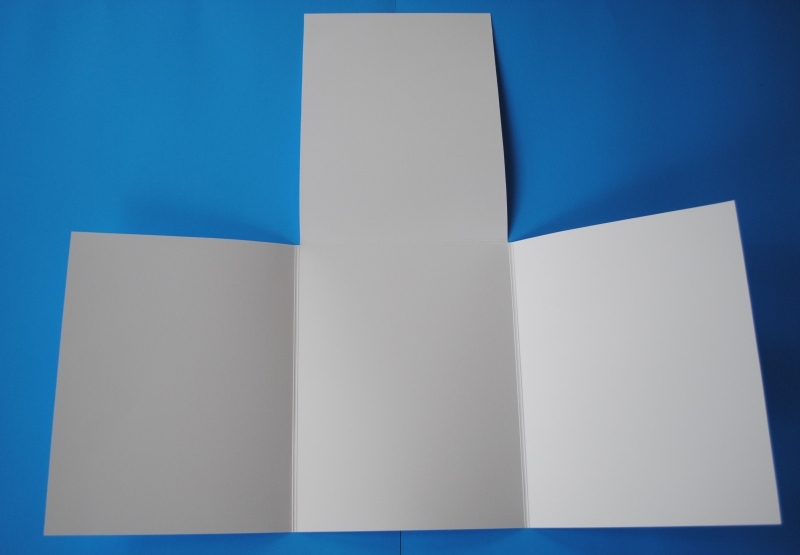 Our Fold-Up Project Bases are one pre-folded and scored piece on sturdy, white, and acid-free cardstock. The scores give room to all kinds of goodies to fit inside when folded and the working area is much larger than a standard manila folder. 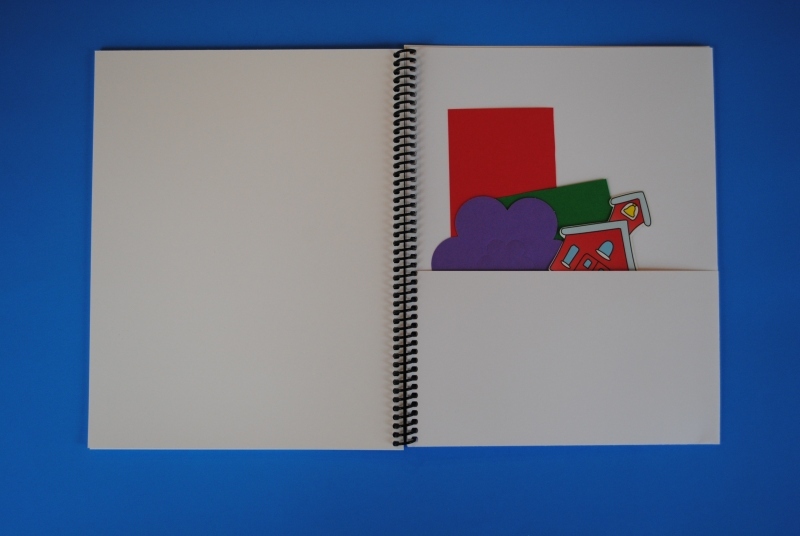 The white background is perfect for stamping, coloring, or whatever your child's creative mind desires! 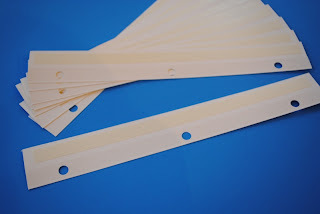 No more taping cardstock to folders! Prefolded and larger than regular mania folders. Double scoring allows you to fill the pages with mini-books, pictures, and paper crafts. Lastly, I've been told that storage of lapbooks is a real issue. So much so, that some resort to duct tape! Yikes! Our Adhesive Strips give lapbookers a clean and attractive option for storing your finished lapbooks in a 3-ring binder. Aren't these much more attractive than ugly duct tape? The so-strong-it-would-pull-car-paint-off adhesive securely attaches to the back of the lapbook. It can be left white, or decorated to match your finished book. The holes are Mylar-reinforced to prevent any tears. Presto! Neat and attractive storage. Let's keep the duct tape to household repairs, not lapbooks, okay? I would love to add more products to our line. We can handle anything paper - just ask! Until then, remember Pear Educational Products for your lapbooking needs. I buy from Amazon all. the. time. A friend just passed along this deal to me, which is good only for the next 20 hours. For full disclosure, if three people buy through the above link, I'll get a free deal in the future. You can also go to www.livingsocial.com. Regardless, I just wanted to share this deal since I know many homeschoolers love Amazon as much as I do! Off to buy some books! Dirty mugs don't make good promotional items! My daughter and I were given some promotional coffee mugs as we were walking out the door of someplace we just visited. My daughter took one look at her mug and said, "Um, Mom, this mug has been used!" 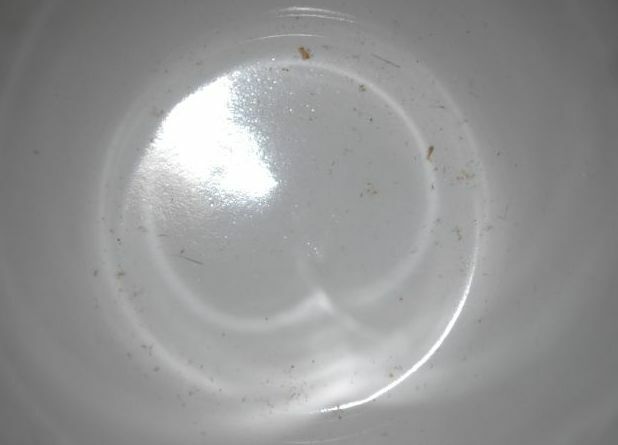 I'm not sure if it was simply dust or was dried up coffee. Either way, it didn't leave the best impression. It did, however, give my daughter and me a good chuckle. Should you be giving out any promotional items in the future, make sure you give them a good scrub first! My daughter desires to be an actress. As a mother, I’m torn between encouraging her to go after what she is passionate about and injecting a healthy dose of realism into her lofty dreams. It boils down to this: I want her to be happy. However, I know full well she won’t be happy if she’s starving! My daughter is an intelligent young lady. She has the potential to go to just about any college and pursue any career she wants. Even careers that pay enough that she won’t need to live in my basement until she’s 40. My quandary, however, goes a bit deeper. As a fresh high school graduate, I was strongly encouraged to go into an field not because of my interest, but because of its financial security. The result was a decent paying job and a passionless employee. Yet, I was very thankful for the secure job as a single woman whose family had since moved out-of-state. Now in my 40s, I find myself involved in projects and hobbies that closely relate to the areas that I was really more interested in, but discouraged from pursuing. So what does a mom, who desires to one day be an empty-nester, do? Step one – academics first. Even though my daughter doesn’t want to go into a science field at the moment, I don’t want to close doors for her by not pushing her in areas outside of her comfort zone. That means she’s taking advanced science courses, because she has the ability to take advanced science course. Interests change and opportunities come along unexpectedly. My goal, academically, is to keep all doors open until they are ready to be closed. Step two – fill the passion box through experiences, training, and real life examples. That means I look for theater opportunities, sign my daughter up for voice lessons, register her with an agency, and enroll her in related classes. Not only does it take the mystique out of an industry, it gives her a chance to see if she really does want to go in this direction. There is nothing wrong with dreaming big, but most don't just fall into their dreams. They work, and work hard, for them. This past Saturday, I spent two hours sitting in a corner of a room while my daughter takes a film acting class with local actor, Gordon Michaels. The goal of the class is to prepare kids for a film audition. Since the film industry has been coming to Michigan more and more because of tax breaks, my daughter has been scouring the internet for audition opportunities. Several movies have been filmed just a mile from our home in our quaint-looking downtown area. Seeing movie cameras along the downtown shops as we drive to the library is not only creating more mystique, but fueling the acting bug even more. As part of “step two”, I get to spend my Saturdays for the next couple of months watching my daughter learn the ins and outs from a working actor on how to impress casting agents. Who knows, maybe she’ll prove me wrong. Maybe, just maybe, she’ll make it to the big screen, or even more to her liking, the big stage on Broadway. Until then, I plan to keep all doors open, whether they are marked "Financially Secure", “Some Unknown Interest of the Future” or "Dreamin' Big". Do you have a spouse that needs straight-forward and personally tailored evidence before considering homeschooling for your family? Convince Your Husband to Homeschool: A Five Step Strategy is available for purchase at Pear Educational Products for $14.95 as a quick download. My husband came excitedly running into the house this weekend and told me I needed to bring my camera outside. 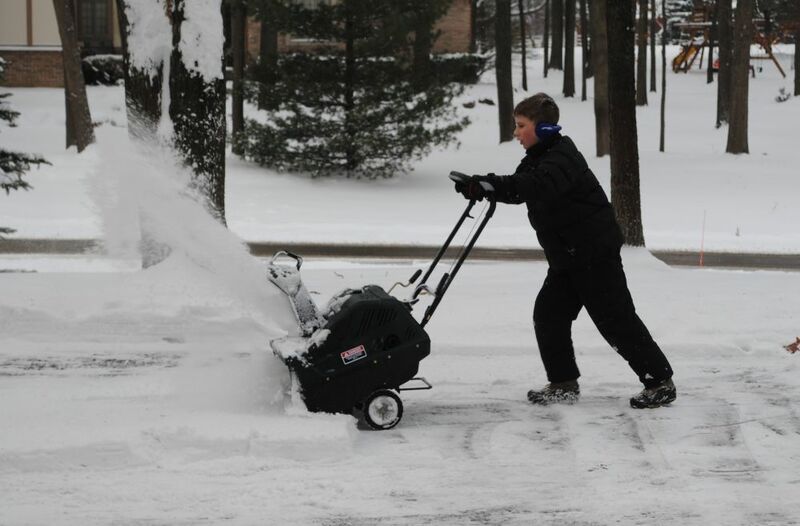 My 11-year-old son, all 78 pounds of him, was clearing the driveway of the latest snowfall. He looks so grown-up and such a little guy, all at the same time. Isn’t that so typical of this preteen age? My son typically hangs out with older boys, most of whom have hit that first growth spurt of the early teens. He looks so small compared to most of them, and it is hard to remember that his time is coming soon. However, when I see sights like this, it reminds me that he isn’t a little boy anymore. He’s right on the cusp of coming into his own. It is exciting so see, to an extent. It also makes a mama a bit sad, though, when her youngest is now old enough to go clear the driveway. My only consolation is that I know he’ll likely go out and play in the snow drifts created by his “man work”. Snowy days, Legos, and pretend battles with pewter soldiers show evidence that a boy still lingers about. Positive Action for Christ, a publishing house specializing in youth curriculum for fundamental churches, first began as a single ProTeen club in 1969. After requests from other churches to use the materials, a ministry was born. 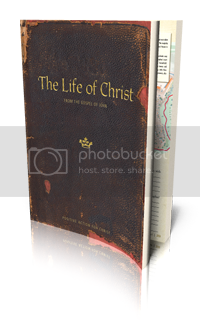 The Life of Christ study comes with a Teacher Manual in a three-ring binder and a bound Student Manual. Included with the Teacher Manual is a CD-Rom that contains overhead transparencies for classroom presentations, which can also be viewed on a computer screen or printed out for small groups or individuals. Additionally, quizzes and unit studies are provided. Each lesson has a pre-class reading that is followed by questions for the student. The questions are designed to help a student's mind "ponder Him and His teaching". They are designed to get the students thinking, rather than fill their minds with facts. Make a chart showing how each of the major false religions and cults of the world deny and oppose the deity of Christ. The curriculum is meant to be flexible to suit classes that meet once a week to several times a week, as well as be adaptable for independent study. With 35 lessons, this is a full-year curriculum. Student and Teacher Manual sample downloads are available if you'd like to take a closer look at the structure of the program. I’ve had trouble finding Bible studies that meet my criteria. Personally, I’ve been through too many that require little more than having the user pull answers from the text and transfer them to blanks on an answer page. However, I didn’t find that The Life of Christ lacked substance at all. It is a very thorough study and I enjoyed the material it covered. It did have items to look up and place in blanks, but it wasn't so simplistic that it bored the user. Overall, I was impressed with the thoroughness of the study. With teacher and student manuals, and a CD of overhead transparencies, it is definitely geared more toward a classroom environment. My daughter (almost 14) much prefers independent studies and would really prefer to not have me teach her from a manual. Given this, I gave her the student book, showed her what she needed to cover as part of the “pre-lecture” work, and then gave her the Teacher Manual for the balance of the lesson. I enjoyed reading the material in the Teacher Manual myself, and I thought she may too. Unfortunately, she felt the presentation was too “schooly”. She commented that she'd much rather just read her Bible and attend her small group with fellow teenagers. In that respect, this curriculum didn't really work for us at this moment for independent study and the format really does lend itself better to a group environment. The content is certainly meaty enough to give opportunity for discussion and pondering. I did want to note that while the suggested grades include middle school, I felt this was more appropriate for high school, at least in most cases. Also, as with any Bible curriculum, you many want to review the Doctrinal Statement, which can be found on the About Us page. While my beliefs don't align with every part of the Doctrinal Statement, I also didn't find anything in the lessons that were objectionable. The Life of Christ Teacher Manual is available for $41.95 and the Student Manual for $17.95. Both can be purchased at the Positive Action for Christ website. To read what others had to say about The Life of Christ, please visit the official TOS Crew blog. If you've ever hired a tutor, you know how costly they can be. Tutors in our area run anywhere from $25-50, depending on the subject and expertise of the tutor. As much as it hurts the budget, sometimes a little extra help is necessary in getting over an academic hump. The one-on-one attention, with the ability to stop and ask questions during an explanation, is needed when a student is having difficulty with a concept. Sometimes searching the internet and sites like YouTube for tutorials just doesn't cut it, you know? But private tutoring isn't affordable at all to some, and certainly not regularly for most. It would be nice if there were something in between private tutors and random internet searches when academic roadblocks are met. Meet Virtual Nerd, an online service that offers video tutorials in math and science, including Pre-Algebra, Algebra 1, Algebra 2, and Physics. When I first heard about Virtual Nerd, I was a little underwhelmed at the concept. I mean, there are plenty of online math and science tutorials available with a few clicks and a good search engine. In addition, there seems to be an overabundance of math help websites, for a fee or free. What makes this one any different? First of all, let's cover the information presented. Content of these subjects isn't skimpy. For example, there are 450 algebra tutorials that cover a total of 18 hours. In addition, the site has plans for adding more subjects and new features in the very near future. One feature I thought unique as far as content is the textbook search topics. The textbook search gives a student the option of finding tutorials and example problems that correlate to a particular text. Right now this feature only covers Algebra texts from Prentice Hall, Holt, Glencoe, and McDougal Littell. However, if you are working from one of the available texts, it is a pretty neat feature. Probably the most useful feature of Virtual Nerd is the Dynamic Whiteboard. As the video tutorial is playing, a student can view all of the steps on a small whiteboard just to the right of the video. Within the whiteboard, students can advance the video to specific steps or find in-context links to pre-requisite videos on that concept. Also, once the video tutorial is completed, related tutorials are recommended. Area #1 is the video presentation. Area #2 presents the problem as a digital whiteboard format. Area #3 gives the student the ability to interact by jumping to individual steps, read definitions of terms, or get links on related content. In addition to the above, the instruction in each tutorial is clear. I appreciate that the tutorial presenters are young, enthusiastic, and include both males and females. The website is also very easy to navigate and has a pleasing and professional look, without a lot of unnecessary information. I was able to use Virtual Nerd with both my 6th grader and my 8th grader. My 6th grader was able to use it for some of the pre-algebra concepts found in your typical early middle school curriculum. My 8th grader, currently in Algebra, was able to find plenty of tutorials for whatever concept she was studying. Neither had any trouble with the explanations, nor navigating the site. Often times I would just add to their daily schedule a search word or phrase that covered a topic they needed some refreshing or explanation on, and have them go independently from there. I would have loved to see some chemistry tutorials, and soon found that was planned for the near future (August 11), along with other math and science subjects. Overall, I think Virtual Nerd is a well-done website that provides a more affordable alternative to a private tutor and is more focused than some of the other sites out there. I felt the regular monthly fee was a bit steep for casual use, but the value increases considerably if one is able to make use of more than one subject and/or uses it as a regular tool for homeschool learning. Other memberships are available if the monthly fee is out of your budget. A free 2-hour trial is available if you would like to try before you buy, always something I recommend when available. Other options include a $5 day pass, $19 weekly pass, $49 monthly fee, or a $129 3-month subscription. This appears to be an evolving website with many changes and additional services in store, including new subjects and features, such as quizzes. It is definitely a site to keep an eye on. Visit the Virtual Nerd website for more information or to sign up for a membership. To read what others had to say about Virtual Nerd, please visit the official TOS Crew blog. Kaplan is giving away FREE e-books! Through 1/17/11, you can select from 130 titles entirely FREE for your Nook, Kindle, iPad, or Sony eReader. Even if you don't have one of these nifty devices, you can download software to your PC and have access to the ebooks. While I'd love a Kindle or Nook, I don't own one (yet). Instead, I downloaded the Kindle software to my PC. Considering AP courses? Changes are in the future. Even though it is only January, I am already in the planning stages for the 2011-2012 school year. In addition to next year being dd's first official year of high school, many online courses are already registering. It puts the pressure on this homeschooling mama to make sure my act is together and to plan appropriately. One area that I've been heavily considering is AP (Advanced Placement) courses. If you aren't familiar with AP course, visit the College Board website to learn more. You can also read my previous post titled AP Exams and Courses for Homeschoolers. One of the criticisms of some AP courses is that the huge focus on teaching for the test creates an environment where students more or less are required to just cram in information, rather than be able to explore, take rabbit trails, or go in-depth. Others have warned me that AP courses are full of busywork and don't embrace true learning. I'm sure it depends on the teacher, but I have noted the warnings as I look at our AP options. One course I was considering was AP Biology. Dd has already had high school level Biology and Marine Biology, and is currently enrolled in Chemistry. However, her math skills do not meet the prerequisite for Physics, a common course to follow Chemistry. In our case, AP Biology made sense as the next step, except that it is one of the most rigorous AP courses/exams available. Some traditional schools offer this course as a 2-hour daily course, plus an hour weekly lab, just to cover all the material required. In order to take this course, dd would have to compromise elsewhere to fit it in her schedule. It was still in the running, but I wasn't exactly happy with what it would do to her schedule. My decision just became easier. The New York Times recently ran an article about upcoming changes on AP exams, AP Biology included, as soon as the 2012-2013 school year. The changes will place more of a focus on critical thinking skills, rather than information volume. Of the current 56 chapters of a 1400+ page text, as many as 20 chapters (all or part) will no longer be needed for the new version of the exam. Other changes are in store, including higher level math concepts and more free response questions. This was very timely information for me as I make decisions next year. I definitely plan to wait until the changes are in effect, if dd even takes it at all. In our case, time is on our side and there is no need to take AP Biology next year. We are currently looking at AP Government and AP English as options. AP Government is considered one of the easier AP exams. Dd will need a civics credit to graduate, so I figure it might as well be AP. Even though it isn't regarded as one of the more rigorous AP courses, the AP will look better on her transcript than a regular or honors government course. The AP English is listed in the article as one of the courses that won't have revisions until much later and waiting for those changes really isn't beneficial in our case, or perhaps not even possible, since they may take place after dd's graduation). If you are considering AP courses for your homeschooler next year, definitely take note of the upcoming changes when making your decision. It sure saved me some time in the decision-making process. Do you follow a traditional school day/time/schedule/year? Can you guess my answer? I'm not any better following a traditional school schedule than I am following the Blog Cruise schedule. And that's ok. It works for me. When we first started homeschooling, when of the big advantages I saw was that we didn't have to follow a schedule put before us by someone else. We had the luxury to take vacations in the fall or simply have a down day when we needed it. For the first several years, I took the whole month of December off. I figured it would be stressful trying to get school during a busy holiday season, so why go there? We don't take December off in its entirety anymore, since it no longer works for us. We've been forced into conformity somewhat by outside classes. But, we had the choice to take those classes or not, and it is still a self-imposed schedule. During those first years, though, my kids didn't envy the kids standing at the bus stop on Dec 23rd one bit! The other area in a traditional school schedule that I can just not follow is waking up bright and early. None of us are morning people, so why in the world would we get up at 6 a.m.? Now, I do wish we'd get going earlier than we currently do, but I have no desire to get up at the crack of dawn on a cold Michigan morning. I asked a friend what time her middle school daughter gets up for public school. I was told she gets up at 5:30 a.m. to be ready for the bus at 6:30 a.m. First hour starts at 7:19 a.m. (Don't you just love the weird times schools start in order to meet seat time requirements?). I'm sorry - my kids aren't going to crank out too many math problems at 7:19 a.m. or any other time that starts with a 7 and ends in a.m. I used to feel a bit inadequate about this until I received a big stamp of approval from our very traditional and by-the-book pediatrician when she asked about my kids' sleep habits and I sheepishly divulged their resting hours. "Growing kids need their sleep! A big advantage you have as homeschoolers is that they don't have to get up early for school. Let them sleep in as long as they like; they need it!" There you have it, doctor's orders to sleep in! Now, I don't follow that advice exactly. I do have standards and would prefer to start school before noon, which wouldn't be possible if I let them sleep as long as desired needed. However, it was good to hear the advice to embrace our laziness natural body rhythms in the name of health and learning! We also school year round...sort of. It is more of a must-do-math-in-July-to-finish-the-year than a we-love-math-so-much-we-want-to-do-it-all-the-time scenario. Because we adapt our school schedule to suit our needs, we aren't always "done" in June. There are certain subjects and material that I require to be completed each year, so in a sense we really do follow a traditional schedule for the year as far as material. It is just a matter of "when" that is up for negotiation. Even if work is completed in June, we still do some formal learning throughout summer. I don't want my kids to shut off their brains for three months, only to have to spend the first three months of the official school year turning them back on. It is a hodge-podge schedule from June-August, but we just keep on keepin' on during the summer, while enjoying things a bit more relaxed. Even though we take days off when we need them, stay tucked in our beds in the early morning hours, and dabble in summertime work, I find myself conforming more to a traditional schedule as my kids get older. My oldest takes many online classes, which typically start in August and end in June. The local support group I run also offers classes during a typical school schedule (though we do take all of December off!). And while we aren't starting school at 7:19 a.m., we aren't getting done at 2:07 p.m. either. My kids cover just as much material, and likely much more, than traditional school students do in a day. The only difference is mine are more rested! As in real life, there are some things you just have to follow and stay on schedule. When I was working outside of the home, I had to get up at 5:30 a.m. in order to get my daughter to daycare and be at my desk at 7:30 a.m. It certainly didn't follow my natural body rhythm by any stretch of the means (my co-workers knew not to speak to me for an hour or so), but sometimes you just need to conform in order to make it work best for you. In this case, I needed a paycheck. In my kids case, they need an education. But if you have the flexibility to get accomplish what you've set out in a manner that works best for you, why wouldn't you? Find out what my fellow TOS Crewmates have to say about this topic by clicking the button below. If you have a child that struggles with tracking and other vision issues, you know what a hurdle it creates to fluent reading. It is frustrating for children that have the ability to read, but eyes that aren’t up to speed with that ability. My son tends to skip words, pull words from lines above and below, or simply lose his place when reading. His eyes are getting quite a workout trying to read. In the past, I’ve had him read with index cards, color overlays, special plastic strips, or just a plain bookmark as a guide during his reading. When I was given the opportunity to review See-N-Read, I kind of had a been-there-done-that attitude toward the product. However, I did discovered that I like See-N-Read more than similar products I've used. See-N-Read has three different product types available: the See-N-Read series, the Memory Mark series, and the electronic e-See-N-Read. 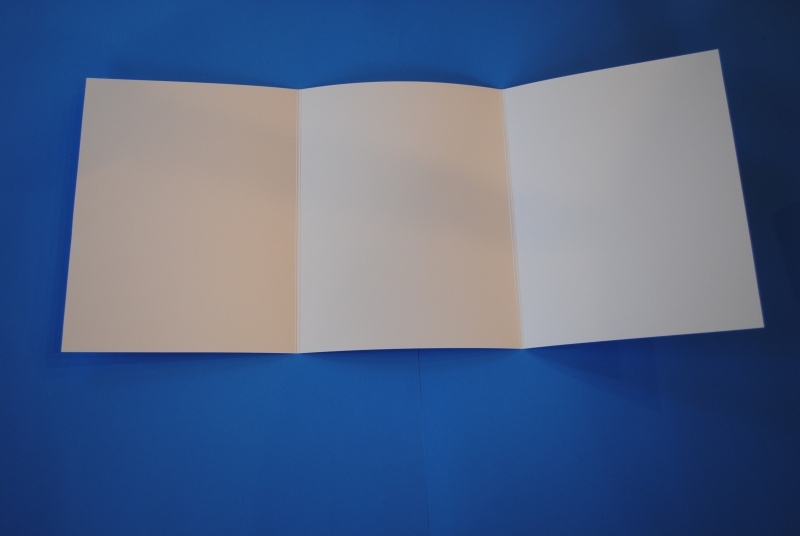 The See-N-Read and the Memory Mark come in two different sizes, a book size (5 1⁄2” x 3”) and a document size (8 1⁄2” x 3”). The See-N-Read is a well-designed reading tool. One of the biggest advantages is the transparent gray area. The gray isn’t distracting, blocks a sufficient amount of text below the reading line, yet easily allows the reader see the words in this area. This enables the eyes to continue on to the next line without interruption while the reader shifts the tool down. It is especially helpful in the case of hyphenated words. The Memory Mark has a nearly identical design. The only difference is that the ReadBar (the clear window) is cut out, so the reader can make notes or highlight in the area. This would be perfect for older students to highlight portions of a textbook. Usage is self-explanatory. You simply place the tool over your page and read. My son’s reading when using the tool is significantly improved. It is more fluent, with fewer skips, loss of place, or words from other lines read. While he doesn’t particularly like using these sort of tools, I noticed his toleration for using this one was much longer than products we’ve tried in the past. When he tires from holding or moving it down as he reads, I simply held the book and tool for him for awhile. I mostly use this tool when he reads aloud to me, though I would like to see him use it in his casual reading as well. It does help him focus on what is being read, and keeps his eyes from working harder than necessary. Since they can double-duty as a bookmark, it would be beneficial to have a few extra around to place in current reading material. The last item I received was the electronic eSee-N-Read. This electronic tool, that looks just like the physical product, is used on a computer screen, PC projection devices, and interactive whiteboards. It can be easily resized, reshaped, and shaped to fit based on the users needs and equipment. The download and install was simple. With a few clicks, the eSee-N-Read will appear as an overlay on your screen. I find reading large chunks of text on a screen difficult. My eyes tire quickly and I even use my finger on the screen occasionly to track. My son doesn’t do much reading on the computer, but my daughter does. One of her courses requires her to read from a large PDF file. She has never complained of having trouble reading from her files (must be the young eyes), but I had her give the eSee-N-Read a try. She didn't feel the usefulness was enough to bother, but my 40-year-old eyes disagree. I found it significantly less tiring to read large blocks of text on-screen when using eSee-N-Read. If you are required to read many digital documents or decipher a lot of on-screen text, it definitely has value. It was pricier than I would personally spend on casual usage, but a nifty tool nonetheless. Overall, I found these to be nifty little reading tools. I liked the grey color better than clear or other color overlays. The size was better for handling and blocked more text, while still allowing the reader to see the words if rereading was required, which kept visual distractions to a minimum. Overall, I felt the design has been well-researched and designed, and the product worked exactly as intended. Those who have or are teaching someone with vision tracking issues would definitely benefit from the See-N-Read products. I can also see those who read a lot, on and off screen, particularly items for work or study that require a high attention level, getting much from this product. Also, these would be helpful tools for children who are advanced readers, yet with physical eye development that hasn’t caught up to reading ability. If you are interested in the research behind the See-N-Read products or reading supporting articles, visit the See-N-Read website to learn more. You can also purchase the products with prices starting at $2.99 for the See-N-Read and Memory Mark and $29.99 for the eSee-N-Read, with quantity discounts, package prices, and multi-user license prices available. To read what others had to say about See-N-Read products, please visit the official TOS Crew blog.